Perched on top of a stunningly pretty hillside village (access by car) designated of special historical and architectural interest, this is a cosy,comfortable two-bedroomed property with panoramic views of the surrounding countryside. Comprising open-plan sitting room and kitchen, bathroom, two bedrooms in converted attic with low beams, and utility room, the property has all conveniences including TV, washing machine and modern bathroom. Tastefully decorated throughout, it sleeps five. Circular staircase. Outside space with washing line and small terrace with table and chairs. Open fire and electric heaters. Parking a minute's walk away. The village has a combined shop and cafe/bar and a Michelin-starred restaurant, La Bergerie. I am a free-lance translator who lives in Morocco (one son, aged 7, divorced). I grew up in Hertfordshire, with a French mother and British father and have always had a love affair with French language and culture. I loved the area and instantly fell in love with the picture postcard village of Aragon, with its unique history and warm, friendly inhabitants. It is close to Carcassonne with all its many attractions and on the doorstep of the Black Mountain area with its lakes, walks and beautiful scenery. It was the panoramic views from every room in the house that made me fall in love with it, as well as its quiet position at the top of the village. Outside house or 30 seconds' walk away. This is a delightful, get-away-from-it-all location that combines the experience of staying in an authentic, traditional French village (grocery/bar/cafe) with easy access to the town of Carcassonne with its many historic and cultural features and the beautiful surrounding countryside of the Black Mountain with its lakes, rivers and forests and many summer leisure activities. 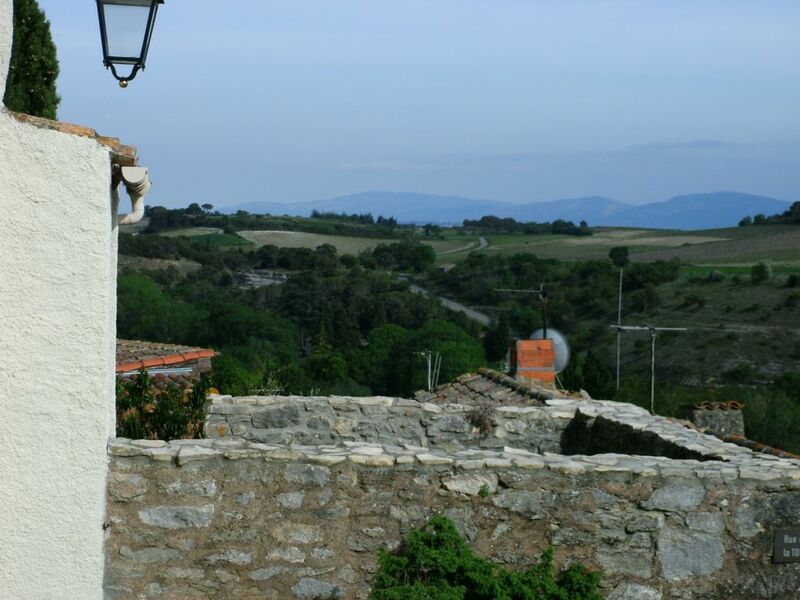 Carcassonne 15 minutes away: 2-bedroom cottage perched on the top of a stunning,historic hillside village surrounded by countryside and with the Pyrenees and the local Black Mountains visible in the distance. In the heart of Cathar country, with its fascinating castles, and with easy access to the sea, the area affords many tourist attractions and activities. Carcassonne is rich in cultural life with numerous festivals, particularly in the summer. Golf: There is a golf course on the road to St Hilaire just outside of Carcassonne. Ski: Nearest ski station at Puy Valador. 200 euros in cash paid to property caretaker on receipt of keys, repaid at end of stay. It is expected that holidaymakers will leave the property in a presentable state at the end of the stay.